The government’s decision to demonetise currency despite its obvious flaws has had some interesting effects. In the Northeast, from promissory notes to Bhutanese currency to no newspapers, the government’s announcement had some curious impacts. As businesses have slumped by 50 percent, Knappily looks into the implications of the decision and how the region is tackling this challenge. What has the Northeast done? In a state which flaunts the culture of Nghahloh Dawr (unmanned street shops), a novel idea has come out of the demonetisation move. In Mizoram’s Khawbung village bordering Myanmar, a shopkeeper came up with the idea of handing over ‘I owe you’ chits quoting the amount with his/her signature as a mode of financial transaction to tide over the sudden cash crunch among the villagers. P.C. Lalmachhuana, who owns a hardware shop in the village market, shared his idea of using paper as promissory notes among the shopkeepers and vegetable sellers, who liked it and gave it as an option to customers without liquid cash. Meanwhile, currency supply continues to be scarce in the capital city of Aizawl, with no ATMs giving out money, and banks running out of cash too often. To overcome the continuing cash crunch, villagers along the Indo-Bhutan border in Assam have resorted to using Bhutanese currency. As per local media reports, the value of these currency notes has risen by over 20% in the last few days, to match that of Indian rupees. Local residents of Dadguri, Hatisor and other villages in the state’s Kokrajhar district said these currencies became “the natural choice” of financial exchange for them “as they are easily available due to the open border”. These areas neither have any banks nor ATM machines. “The nearest bank is 50 km away. 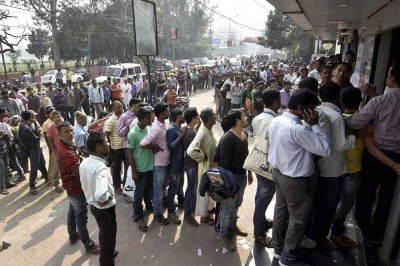 Once a week, a van from the State Bank of India comes with money, which has not come this week,” a local person was heard telling an Assamese news channel. 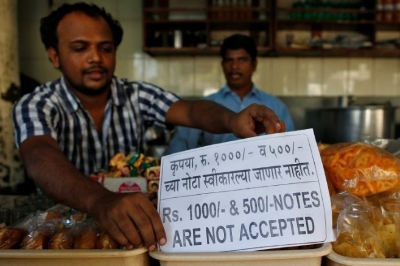 According to reports, a Bhutanese note of Rs 500 usually fetches Rs 400 in Indian money in these areas. However, due to the demonetisation move, the trend has reversed, leading people “to lose Rs 100 Indian rupee exchanged for Rs 500 Bhutanese money”. Currency notes have never meant much for people of the Olo sub-tribe of the Nocte community who live in villages such as Chinghan, Horu Chinghan, Konyu, Konsa, Noglo, Nisa, Changkhao, Pongkong on the Myanmar border in Arunachal Pradesh. With high-value currency notes out, the villagers have simply gone back to barter, part of their way of life anyway. Why is this challenging for the Northeast? If demonetization was not enough to cause troubles for people, the residents of Northeast are facing double the trouble. The Federation of Industry and Commerce of North Eastern Region (Finer) today said the Northeast has been the worst affected since demonetisation, with business slumping by 25 per cent. However, the federation said it expects the economy to get back on its feet within six months. Demonetisation has affected the Northeast the most because banking penetration in the interior areas is low compared to other regions of the country. Small-time traders have been immediately hit by the move as they hinge mostly on cash for their daily transactions. They are not only forced to go cashless but also fuel-less. 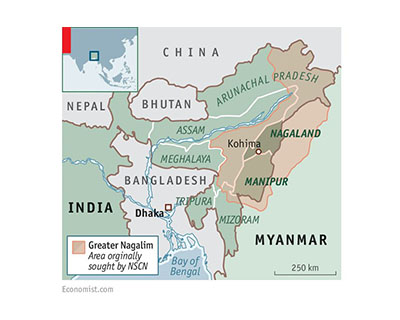 On top of this, there is an economic blockade on the National Highway due to differences between Nagas and Kukis- tribes of Nagaland and Manipur respectively. The entire state of Manipur was facing acute crisis of fuel with petrol pumps almost going dry. When did the government intervene? Unlike in other states, the BJP government in Assam took a step, reportedly through “the direct intervention of the prime minister’s office”, to help tea garden owners to immediately access cash worth lakhs of rupees through the local deputy commissioners’ offices, in order to give the weekly payments to their labourers. 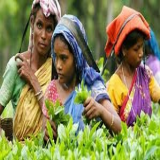 About ten lakh tea garden labourers working in over 900 tea gardens of the state survive on payments made in cash every weekend. According to Tea Board of India sources in Guwahati, even a medium range garden need liquidity of about Rs 20 lakh for this purpose every Friday-Saturday. As per informal data, the industry needs about Rs 90 crore every week to disburse wages. 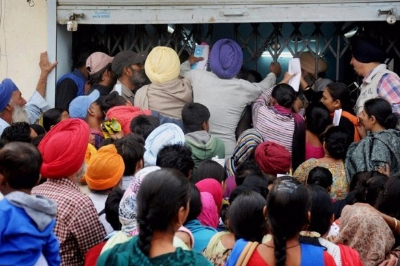 Local news reports said the prime minister’s announcement came as a bolt from the blue to the garden owners who, through various associations, shot off letters to the Reserve Bank of India and the state government pointing out “a possible unrest” among the labourers due to non-disbursement of wages. In the past, there have been several incidents of violence by labourers due to the untimely payment of wages. Aware of such incidents, chief minister Sarbananda Sonowal stepped in on November 10 to direct the deputy commissioners in every district to seek details of cash requirement from the tea garden owners. On November 12, state finance minister Himanta Biswa Sarma told newspersons that the PMO made “special arrangements” for the tea garden management. In the last assembly polls, the BJP mobilised the votes of the tea garden community (mostly labourers attached to different gardens) to be able to wrest Assam from the Congress. The community has long been considered the traditional vote base for the Congress, particularly in upper Assam. Where has it had a positive impact? The policy has made a huge impact on the financial status of the insurgent outfits, in the North Eastern frontier of India, especially in the state of Manipur. 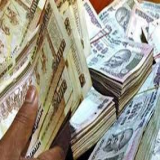 It seems like central government's decision to demonetise the currency notes of Rs 500 and Rs 1,000 for the sake of crippling terrorism and insurgency from every nook and corner of the country, is slowly changing the conditions on the ground. The president of Thadou Peoples Liberation Army, one such banned outfit, James Thadou said, "Demonetisation has badly affected the organisational work of the party and is somehow managing to run the organisation." Who else has it affected? Nepal Prime Minister Pushpa Kamal Dahal on November 15 called his Indian counterpart Narendra Modi amid growing tensions in the Himalayan country over demonetisation of Indian currency. It is believed that 29 million Nepalese citizens are holding Rs 1,000-1,500 crore in denomination of Rs 500 and Rs 1,000. 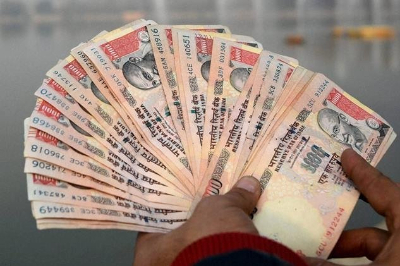 In Nepal and Bhutan, Indian rupee is the second currency and is freely transacted. India had recently permitted people travelling to Nepal from India to carry up to Rs 25,000. 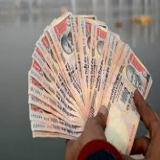 There are media reports that people from bordering Nepal, which shares 1,850 km with five Indian states – Sikkim, West Bengal, Bihar, Uttar Pradesh and Uttarakhand – are flocking to India to exchange their Indian currency. Business is mostly affected in the Madesh area, which has 21 districts. The Madeshis mostly trade in Indian currency due to its closeness to Bihar and Uttar Pradesh. 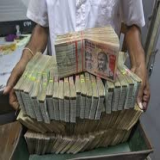 The Reserve Bank of India has after this formed a task force to ease currency exchange facility in Nepal for non-Indians who possess the now-defunct notes of 500 and 1,000 denominations, as a Nepalese parliamentary panel asked the government to take “necessary steps” to settle the issue. The task force has been formed by the RBI and will come up with modalities to address the problems faced by people of Nepal and Bhutan. How might this affect the elections? 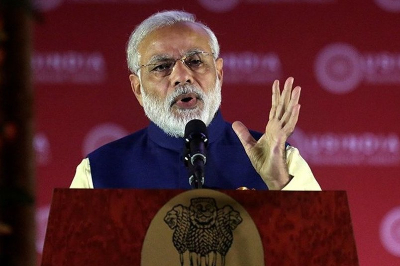 Post-demonetisation, the BJP-led NDA government will face its maiden test in the by-elections to one parliamentary and four assembly constituencies in the Northeast on November 19. According to industry sources, business has been down by 50% in the region following demonetisation. The lone parliamentary constituency in the Northeast going to by-polls is Lakhimpur in Assam. The seat was earlier held by Sarbananda Sonowal but after his election to the state assembly and subsequent appointment as the chief minister, it was lying vacant. The BJP has fielded a sitting MLA, Pradan Baruah, in the seat. He is up against Congress’s little known Hema Hari Prasanna Pegu, a doctor. Assembly constituencies going to by-elections include Baithalangso in Assam, Hayuliang in Arunachal Pradesh and Khowai and Barjala in Tripura. 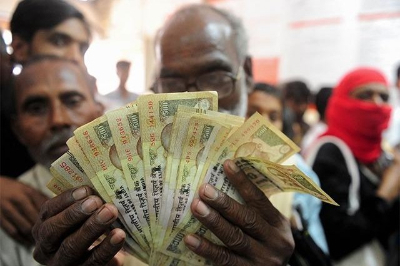 These elections could be a small litmus test of the effects of this demonetisation policy. Since media reports are divided on the issue, this could perhaps be more accurate.